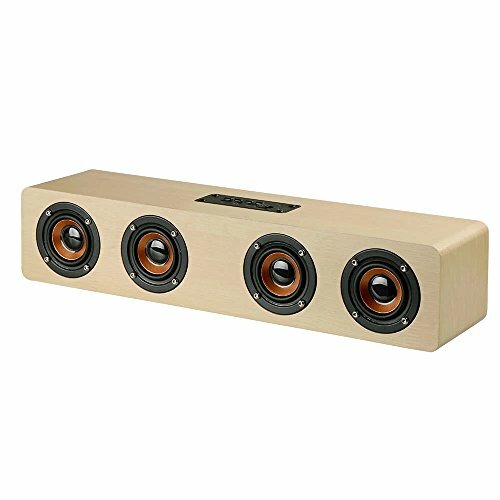 - Wood grain Bluetooth speaker is made from environmental-friendly and high density synthetic fiber wood. - It can effectively eliminate bad resonance, bring you fuller and shocking sound quality. - You can enjoy 360° surround sound, strong sound especially when playing games and watching movies. - Bluetooth 4.2 technology helps you to pick up hands-free call with built-in high definition. - Up -scale and high quality wooden speaker makes it an artwork in your home. Portable Bluetooth Speaker: Bluetooth 4.2 + EDR wireless transmission, working distance up to 10 meters. Multi Mode Speaker: 3.5mm AUX-IN port can be connected with phone, computer, tablet PC, etc. Modes switch between Bluetooth, AUX-IN, TF card, multi modes, more choice for music. Large Capacity Battery.Built-in 3000mAh rechargeable lithium battery, provides 4-8 hours of music time and 4-8 hours of talking time. Stereo Natural Sound: Clear sound and powerful bass, let you enjoy unfettered perfect quality stereo music anytime, anywhere.